This week the non-profit Shared-Use Mobility Center released its blueprint for the future of Southern California. 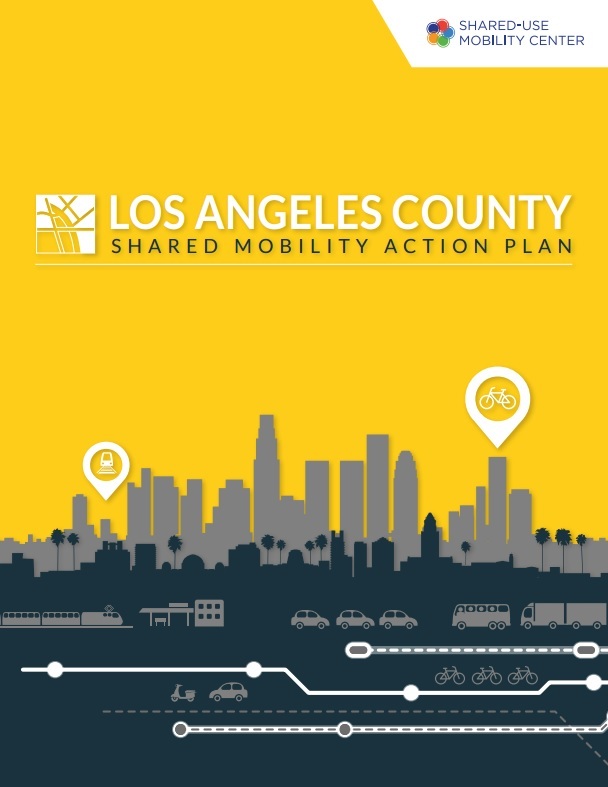 The Los Angeles County Shared Mobility Action Plan [PDF] outlines a future for L.A. County with expanded transit, car-share, bike-share, ride-hailing, mobility hubs, and more. The plan predicts that all this will lead to 2 percent less driving, meaning roughly 100,000 fewer private cars on L.A. streets in five years. The new plan is more a vision than an adopted city plan, with no public agency imprimatur or funding behind it. Nonetheless, the plan lays out a series of recommendations, emphasizing expansion of shared mobility. The vision is a compelling one: significant increases in transit ridership (34,000 new riders), bike-share (10,000 new bike-share bikes), car-share (8,400 new car-share vehicles) and carpooling/ride-splitting (16,800 new riders.) In order to achieve these increases, the plan prescribes relatively modestly increased funding for government agency programs: $16 million for car-share, $33-38 million for bike-share, $4-6 million for augmenting ride-hail, and $6-10 million for mobility hubs. These all complementing Measure M and existing funding streams for transit, active transportation, and the like. After the jump, find bullet summaries of the key plan policies and programs, many of which building on existing efforts already underway. Integrate TAP car payment to provide seamless payment for car-share, bike-share, and carpooling. Expand employer TDM (Transportation Demand Management) programs to encourage transit and shared mobility. Expand shared mobility modes integrated with transit. Use shared mobility to address late-night service needs. Expand para-transit services using shared-mobility. Expand car-share and bike-share, including at transit hubs in suburban areas. Implement land-use policies that encourage transit and shared mobility. Incorporate shared mobility into student transit passes. Provide dedicated street space for car-share. Incentivize car-share in large residential developments. Expand use of car-share in governmental fleets. Bring peer-to-peer (P2P) car-sharing to L.A. Expand bike-share to smaller cities. Design bike-share systems to be more equitable. Locate bike-share at highly visible sites. Start micro-transit pilots, such as dynamic shuttle service to Rams games in Inglewood. Design pilots to address job access for the service sector. Use ride-hail to support carpooling and vanpooling, such as using Lyft/Uber for employer emergency ride home programs. Pursue partnerships for transit first/last mile. Establish standards for mobility hubs. Design BRT and rail stations to encourage multi-modal transfers. Plan and build mobility hubs at transit stations countywide. For the full details, see the Los Angeles County Shared Mobility Action Plan [PDF]. See additional plan coverage at Curbed and KPCC. What do you think, readers? What roles will shared mobility play in Los Angeles’ multi-modal future? Can shared mobility break out of its most common user to advance equity by serving low income neighborhoods? How can communities and government agencies ensure that sharing serves critical mobility, health, and equity goals? Why not just raise some gas taxes? You know we are the cheapest out of all the industrialized countries in the world? The only country cheaper than the US is Mexico, when it comes to leveling taxes. Come on, let’s hear the story of the mom on welfare that won’t be able to take her sick child to doctors cause the taxes will be outrageous. Raise some gas taxes and all the sudden people will start driving less. Hell there would even be less speeding! All the sudden things start to change for the better. Right now with the price of gas, it’s about like giving the stuff away! Good luck with your incentives above. I have a great idea. Let’s have a on demand service that delivers a self-driving 3-D printer to your location, where it will 3-D print a self-driving on demand car or self-riding bicycle. You will be so blown away you will forget about your destination and not go anywhere, thus solving the traffic problem. Once the on demand 3D printed-self driving vehicle is printed it will be automatically recycled into soylent and drone delivered before an AmazonPrime subscriber has ordered it. Just what we needed, another Garcetti plan that will generate a bunch of buzz and result in nothing! Doubt any regular Streetsblog readers oppose raising the gas tax, but that’s under the jurisdiction of the state and federal government, not the city or the county. There are cities which impose their own gas taxes. They’re a small minority, but it’s not impossible. It might work if the county were to do it, but at the city level, the mess of city boundaries in Los Angeles county would just end up privileging gas stations on one side of the street (in the next city) over ones on the other. As long as substantial parking requirements are in force (say, >0.5 per bedroom), all this amounts to what Tinseltown has always done best: pretending to give a ****. Well if LA county levied the tax you would see a little opportunism at the boundaries, but I’m not going to drive to Riverside just to fill up. An additional $1.50 in public funds per person in the county in each of the next five years is not enough to get 100,000 cars off the road in that time frame. That’s using the highest cost of $75 million mentioned in the report. It’s more likely to require billions in additional public funds in the next five years to reach that goal in the reduction of driving. One of the reasons for that it that it takes about seven years from start to finish for a light-rail line to open. Which means that if Measure M is approved by voters there is unlikely to be many Measure M rail projects completed in the next five years. The only new Measure R rail lines to open in that time frame will be the Crenshaw Line and possibly the Regional Connector. That’s not enough to make a significant impact in the growth of driving for the county in the next five years. According to the Census Bureau’s American Community Survey (ACS) there were 83 thousand more residents of LA county who drove to work in 2015 compared to 2014. Transit lost 31 thousand commuters. Comparing ACS results for LA county from the beginning of the recession in 2007 to 2015, there was an increase of 218 thousand more residents who commuted by driving. Transit lost 31 thousand commuters. The drop in ridership for LA County Metro is almost as much in the first 7 months of 2016 as it was in the same time frame last year. Which means that there is likely to be another drop in county wide transit ridership for 2016. The Shared Mobility Action Plan Report anticipates an increase of 20,000 more transit riders in the county over the next five years. That would require recovering any lost amount of riders plus an additional 20,000 riders. A likely reason for a large percentage of the drop in Metro ridership in 2015 and 2016 is probably that undocumented immigrants were given the right to obtain a drivers license early in 2015. It will be difficult for Metro to offset those ridership losses by opening new rail lines in the next five years. As an example, the Expo Line has a weekday ridership of about 43,000. Let’s say 40% are new transit riders who use it to commute and each person took two trips a weekday. That’s about 8,600 people who are new transit commuters. If all of the Gold Line Foothill extension passengers are new transit users, and only use it to commute, that would bring the total to 10,000 new transit users. Not nearly enough to offset the loss of 31,000 transit commuters in 2015. Ride sharing companies are only interested in doing business in the most population dense areas of a city, but there is little public cost involved since the road and parking infrastructure already exists. There are very few areas in the county with adequate enough bicycling infrastructure to support a thriving bicycle sharing systems. You can’t just plop a bicycle sharing system where there is little or no bicycle infrastructure and expect people to want to ride there. Carpooling has fallen over the years. Not much potential for growth there. What’s amazing about this report is that anyone would pay for a fantasy which has little basis in reality. There is simply very little possibility that 100,000 cars will be taken off the road in five years by investing only a few million more dollars in public funds. Well, in Garcetti’s defense, he had nothing to do with this one. Lawsuits and Leadership: Where Is Mayor Garcetti On L.A. Mobility? Metro Bike Share’s 2017 Expansion Plans: Pasadena, Venice, Port of L.A.